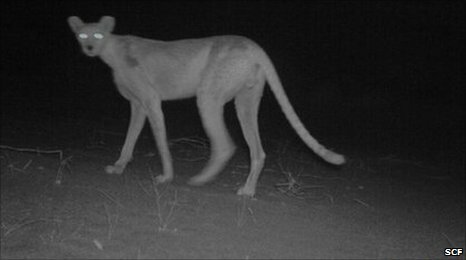 Scientists working for the Saharan Conservation Fund (SCF) took the image as part of the Saharan Carnivore Project, an effort launched in conjunction with the University of Oxford, UK, four years ago to research and document larger predators roaming one of the world's most inhospitable habitats. "The cheetahs of Termit Massif are extremely shy, rarely revealing themselves to researchers and few visitors go there," the SCF's Thomas Rabeil told the BBC. However, "very little is known about the behavioural differences between the two cheetahs, as they have never been studied in the wild," says Dr Rabeil. "From observations of tracks and anecdotal reports they seem to be highly adaptable and able to eke out an existence in the Termit and Tin Toumma desert." "Project personnel have gone to extraordinary lengths to try and observe these animals directly, resorting to extended surveys on camel-back," Dr Rabeil told the BBC. "On one such eight-day journey recently a cheetah eluded researchers, leaving clearly identifiable tracks behind but changing direction and using the desert geography to maintain its enigmatic, elusive reputation," he said.